If you limit your portrait photography to daylight, you’re missing out on a chance to get some really cool people photos. Whether you just want something better from your camera automatically, or you want complete control of the light in the scene, there’s something in this article for you. Read on to get some tips to help you create and shoot night portraits. 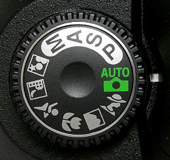 If you’re using your camera in Automatic mode, you’ll find one of two things will happen. With the flash off, you get a really blurry photo because the camera needs a longer exposure time at night. Or with the flash turned on, the camera restricts the shutter speed and while your subject is well lit by the flash (but is flatly lit), the background has gone black. It’s a lose-lose situation, especially if you want to mix a photo of your subject with a cool background. With Auto Flash, the background gets rendered quite dark, and even fully black later in the night. Fortunately, most cameras have a set of helpful scene modes. On the command dial, there are modes like M for Manual and P for Program (or professional as some of my buddies like to joke). But you’ll also find a series of picture icons, like a mountain or a sprinter. The one you want here is the Night Scene mode (you may have to go into your menu to find it). It usually has the moon or a star with a person. This mode allows for a longer exposure, but your flash fires as well. Set the mode and remember that because you’ll have a longer exposure, you need to hold the camera steady. Your flash will freeze the subject, but they need to stay still for the shot as well, to avoid going transparent. You’re not shooting ghosts here! Sometimes this mode will be called Slow Synchro instead of Night Scene Mode. Slow Synchro/Night Scene mode exposes for both the flash and the background, although it can result in image blur from camera shake. When I shoot nightclub portraits, I’m emulating this mode, but I have the camera set for Manual control. I use an aperture and shutter speed on the camera so the background scene looks good, maybe a little under exposed, then I use an automatic flash on-camera to capture my portrait. A nightclub shot taken with the camera set to Manual mode, with exposure set to expose for the background. A mix of high ISO and a large aperture helped prevent camera shake. The flash was in TTL mode, setting flash exposure was set automatically. Let’s look at how you can take even more control now. As you probably tell from how Night Scene mode works, you’re effectively taking two shots in one picture. The first is of your subject, the second is of the background. For complete control of light on your subject, you need to use a light that’s off-camera. This doesn’t have to be a flash. In fact, it can even be a street light, something we can touch on later in the article. It can also be a continuous light that you’ve brought with you, like an LED or video light. But before this, we’ll look at using flash. To get your flash off-camera, you need a trigger to fire it. If you have a flash like the Godox V850II, it has a receiver built-in, so you just need a trigger like the XT-16 or the X1. The same applies to the Cactus RF60X flash paired with the V6II trigger. You’ll also need a light stand or someone to hold the flash and aim it for you. To get an idea of where you can point the flash to achieve great lighting, check out my article on lighting positions. If you want to control the look of the light, have a look at this article 4 Value Speedlight Modifiers that Won’t Break the Bank. The background just needs a longer exposure to render on the sensor. If you want to avoid blurring your background, use a tripod. Even with a tripod, you can opt to use a higher ISO to make the shutter speed shorter. This shot was in Manual mode, and the exposure was set for the background. The off-camera flash was set to manual and was dialed up or down as needed to suit the exposure for the background. The first step you need to make is how much of the shot you want in focus. A wide aperture like f2/.8 means the background will go out of focus, but you can use a shorter shutter speed to expose the background. When using flash, the shutter speed isn’t important for the subject, so you should get the subject flash exposure right first. Set your aperture and your ISO first, 400-800 should be fine. If you’ve got a prime lens, you can even try wider aperture’s which will give a creamy out of focus background. The shutter speed can be anything below 1/200th (or your camera’s sync speed, which will be in your camera manual). Tip: If you can’t focus properly, use your phone flashlight to illuminate the face enough to focus, then switch the lens to manual focus. Aim your flash at the subject at a low power like 1/32 or 1/16. Take a shot and check it. Firstly, if the subject is too bright, turn the flash power down. Alternatively, if they’re too dark, turn it up. Finally, if it’s still too bright at the lowest flash setting, move the flash further away from the subject. This image was shot at 1/250th, which is the sync speed of the camera. Flash power is tied to the aperture below the sync speed of the camera, so you can safely open up the shutter speed to add more light in the background. With that working, you probably have a black background, like the image above. Have no fear, you’re only halfway there. Next, bring your shutter speed down. If you’ve got live view on your camera, use it. Make sure it’s set to Exposure Simulation or Preview Mode On. As you lower the shutter speed (make it slower), you’ll see more and more of the background. When you’re happy with how the background looks, you’re ready to shoot. This lighter image was shot at 1/30th. Notice that the flash exposure on the subject is the same in both pictures. Both shots are at ISO 1600 and f/4.0. As a final note, the subject was completely dark, so to focus I had him use his phone to light his face. I used autofocus to lock focus, then switched to manual and indicated he should stay still. If your shutter speed is really slow, like 1/15th of a second or below, encourage your subject to stay still so they aren’t blurred in the image. Your background can be an interesting building, a bridge or even just a street. For a really cool look, find somewhere with loads of lights. By using a really shallow aperture these look fantastic out of focus. If you bring a something to light your subject other than a flash, there’s a different juggling act that needs to happen. First, you’ll probably need a higher ISO. For these shots, set your background exposure first and then introduce the light on the subject. In the image below I brought in a $35 Godox LED video panel. The panel has both brightness and white balance controls from Tungsten to Daylight. It gives a nice soft quality of light and looks natural. Even better is that what you see in the viewfinder is what you’ll get when you shoot, not like flash, where you’re always guessing. Using an LED panel instead of a flash can be a great option. You can see the shot in the viewfinder and focus easily. If your light doesn’t have a brightness control, you can move it closer or away from your subject to change the intensity on the subject instead. This applies to using a street light as well. If your subject is bright compared to the background, move them further away from the light to get a better balance. Street lights can also be used for night portraits. For this shot, I used a street light across the road as my key light. I moved my subject until I could see a triangle of light on the side of the face opposite the light. A slight tilt of the head helped as well. I chose this spot so I had the railway bridge and cars in the distance out of focus, but the background still retained interest. To go the whole hog, you could get someone to do hair and makeup, as well as getting really stylish clothes to make the shot look even better. You can just use friends and clothes borrowed their wardrobe, but it makes it look properly professional. Here’s a selection of night portraits that I’ve done and details about how they were made. This photo doesn’t contain a background, but I wanted to create the feel of a busy road. I used two bare-bulb speed lights to give the effect of passing cars lighting from the front and back. In reality, we were on an empty road with no traffic. The backlight was positioned as both a rim light and to add flare. I’ve been doing a series of portraits with a red tulle skirt, so it’s appropriate that I include them here. This was shot using a speed light and a 120cm Octa box. The light was off to camera left to create a loop lighting pattern. I’ve balanced the flash and ambient light to get this exposure. There is a mistake in it though. I really should have used a CTO gel (Color Temperature Orange), or at least a half CTO gel to warm up the color of the flash a little. The flash can look quite blue when shot against tungsten lighting, especially the sodium vapor lights in the background here. Nothing here will make any difference if you don’t get out there. If you’ve got no gear, you should start with a battery powered LED work light or even one of the Godox LEDP 120C panels (make sure you get a battery as well). Get your camera off automatic too, and give yourself more control! Sean McCormack is an official Fuji X Photographer and Adobe Community Professional based in Galway in Ireland. He's been shooting for almost 20 years and loves portraits, landscapes, and travel when he gets a chance. He's written a few books on Lightroom.